Clive likes his sport but he loves the Olympics. He remembers first watching the Montreal Games in 1976 on a battered old b&w telly round his Nan's, but it was the 1980 games in Moscow that really roused him with Miruts Yifter 'the shifter' winning the 5000m/10,000m double and Daley Thompson gaining gold in the decathlon. On these pages are some of Clive's works on the Olympics as well as fun facts, quizzes and guides to events at the games. 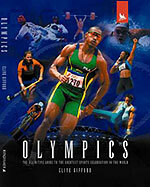 It's the greatest show on Earth and this book seeks to get across the Olympics' extraordinarily rich tradition. Crammed inside are hundreds of astonishing Olympic facts and stories - ranging from long discontinued events such as live pigeon shooting to stirring tales of spirit and sportsmanship and extraordinary battling against the odds. Learn about one-legged gold medallists, six-legged long jumping and all the standout feats, records and antics of the world's sporting heroes and zeroes. With the Olympics set to dominate sport in Britain over the next four years, this is the perfect title to arouse interest and excitement in the world's greatest sporting celebration. Download a PDF double page on infamous Olympic cheats! Sue Magee at Bookbag read Outstanding Olympics and liked it...a lot. 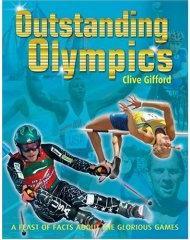 "The fact that this Olympics book is written by Clive Gifford – sports fanatic and award-winning children's writer – is a real bonus. Gifford has a chatty style which pulls you in from page one. Gifford builds a picture of how the Games have developed and it's all done in short 'sound bites' of simple, interesting facts which are going to catch a child's interest. There's inspiration for young sporting enthusiasts as we see the way that Olympians trained or on occasions how little they've done. Cautionary tales abound of unfortunate accidents or funny incidents and some of it is laugh-out-loud funny." "Have you ever read a book where you couldn't resist reading bits out to anyone who would listen? Well, that's what I found myself doing with this book. It's targeted at the eight plus age group but even for someone many decades beyond that age it was still a wonderful read.” – Sue Magee, BookBag. Living Paintings is a British charity bringing information and entertainment to blind and partially-sighted children and adults in the form of 3D touch pictures and audio CDs. Clive supported their work, by researching and writing their Olympics and Paralympics pack for free, including briefing the touch picture makers, writing 15 long audio scripts and, after a famous name pulled out, heading to the recording studio to turn his scripts into audio CDs. To learn more about the charity, head to the Living Paintings website. Using the same team that produced the multiple award-winning Football: The Ultimate Guide to the Beautiful Game, Kingfisher's Olympics charts the story of the Summer Games from their ancient origins right up to the present day. Packed with digital artwork explaining the finer points of technique, explosive action shots from all 30 Olympic sports and detailed fact files and timelines, the book is the perfect guide to the world's biggest sporting event. "A strong, ambitious, and useful title." "This ambitious and current title is a fantastic must-have this summer. Packed with information on standout stars and events. Specific events are introduced with multiple text blocks providing explanations of technique and history. Diagrams and photographs are plentiful and helpful." The Summer Games have seen hundreds of outstanding competitiors put in amazing performances but only the very best on the day can win a gold medal. Here are just a half dozen of the hundreds of high achieving Olympians. Soviet Union gymnast, Larissa Latynina is a real medal hog. In her career, she managed to collect a grand total of 18 Medals., 9 of which were gold. At the 1992 games in Barcelona, the cox of the Spanish rowing eight was Carlos Front. At only 11 years of age, he was the youngest competitor at the Olympics since 1900. At the 1980 Olympics, boycotts meant that some countries were invited to send teams into events they were not contesting. Zimbabwe were asked if they would like to send a hockey team. The players were selected less than a week before the Olympics yet they went on to win the Gold Medal. At the 1988 Seoul Olympics Swedish Fencer Kerstin Palm became the first woman to take part in seven Olympics. Ethiopian running legend Abebe Bikila won the 1960 Olympic marathon and broke the world record with an incredible time of 2 hours, 15 minutes and 16 seconds. Not bad, considering he ran the whole race in bare feet! At the 1996 Olympics in Atlanta, Austrian sailor Hubert Raudaschl became the first person ever to compete in nine Olympics. His first was all the way back in 1964. Every four years, thousands of the world’s top sports stars, tens of thousands of staff, coaches and media personnel and hundreds of thousands of spectators all congregate in one host city. Their aim is simple - to watch, take part in, officiate and report on the greatest show on Earth, the Summer Olympic Games. 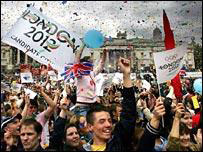 Beijing, China is next in 2008 and after that…will be London, England. Click here to visit the London bid’s website. Try out this short quiz on Olympic hosts. Go to the bottom of page 2 for the answers. Get six or more right without cheating and award yourself a gold medal! So far, how many times has the Summer Games been held in Asia? The United States has hosted the Summer Games: twice, three times or four times? At which Olympics was boxing banned because it was illegal in the host country? In which country was the first Olympics after World War II held? How many times has Los Angeles hosted the Olympics? Where will the 2008 Summer Olympics be held? At what Olympics did Muhammad Ali (then known as Cassius Clay) win an Olympic boxing gold medal? More Quiz Questions and Amazing Facts on the next page!